Your home is your castle – or at least that’s how many homes are designed, with four solid walls to protect inhabitants from the ‘hostile’ environment outside. But that’s not the approach taken by architect Chan Chin Yeow for this award-winning home. Instead, Chan refers to the house as a bird cage house design, a term first used to describe a Miami home designed by architect Igor B. Polevitzky back in 1951. “In a bird cage house, the envelope between the inside and outside is barely distinguishable,” says Chan. 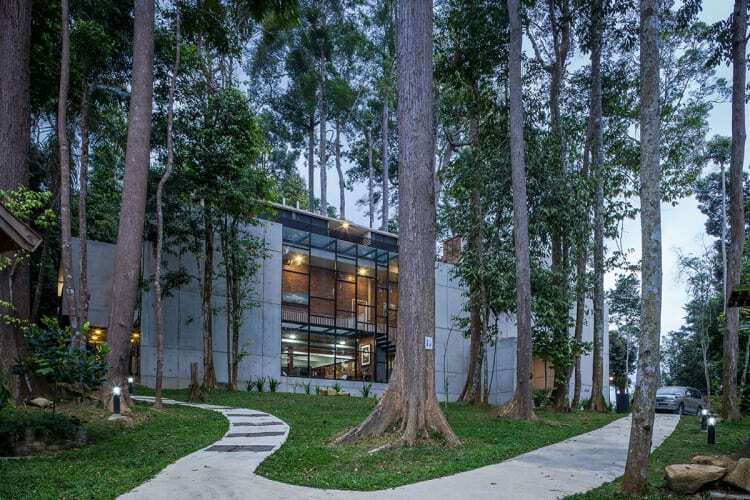 So it’s an apt description for the house he designed for an 8000m2 virgin jungle site about 40km north of Kuala Lumpur. The open nature of the house stems from the way Chan developed its structure as a C-shaped box, which presents as a solid, raw concrete wall on the street side. There is no front door as such on this facade, but a smaller concrete box, wide concrete steps and a void create an informal entrance into the home. Behind the concrete wall is a second wall – this one in brick – and the space between these two walls forms the main circulation corridors for the home’s ground and first floors, and the roof garden. On the other side of the brick wall are the living spaces, with much more transparency and openness on the back facade. The fair-face concrete was cast on site and used for the main building components such as the facade wall, roof, columns and beams, while clay bricks were used for internal dividing walls. The owner occupies half of the ground floor, while the rest of the space is given over to four guest rooms on the first floor and shared facilities such as the ground floor kitchen enclosed in a glass box. Both floors include outdoor, multi-functional gathering spaces.